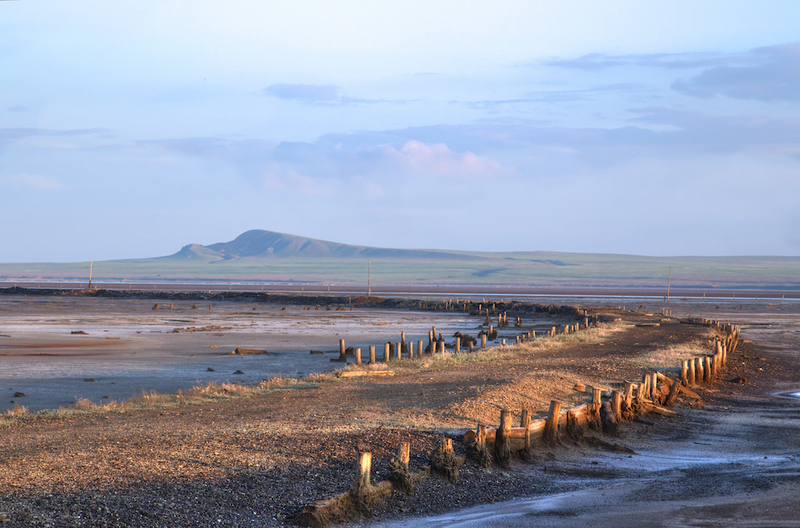 Heat, mud, wind, salt, water, desert, ice — at Lake Baskunchak you can have it all. 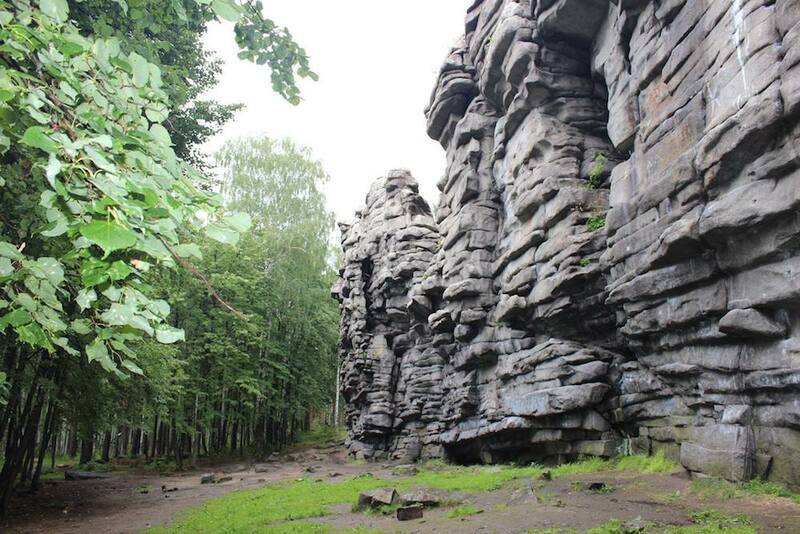 For Buddhists, this is a holy place — and it is also one of Russia’s most unusual gateways. 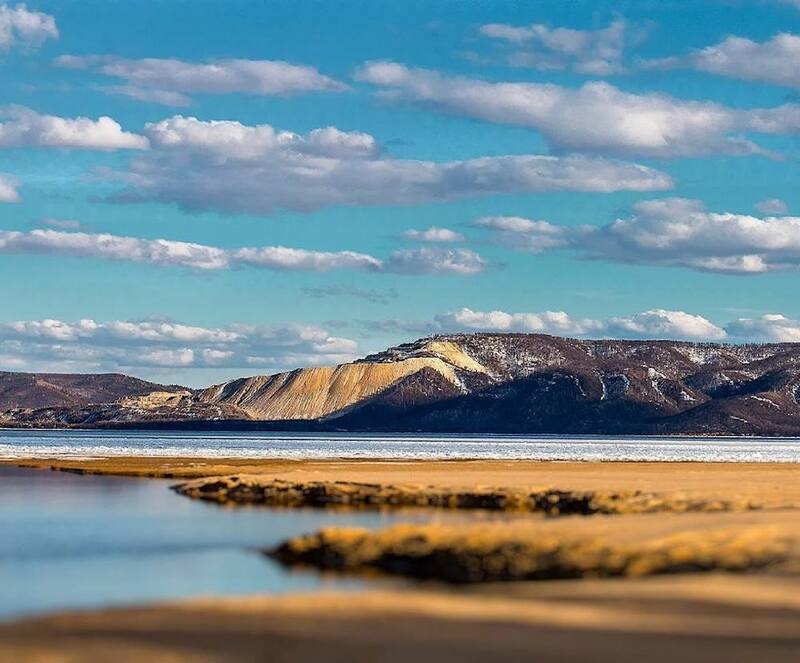 The ancient lake, which is the peak of a huge underground mountain, is Russia’s largest saline lake and generates up to 80 per cent of the country’s salt. Its thick and shiny surface transforms the setting into a mirrored white and blue heaven dotted with people carrying huge plastic bottles of distilled water around — no drinking stations are included in the entrance fee to this paradise. Take the four hour journey on a local bus from Volgograd and the trip becomes a proper pilgrimage. 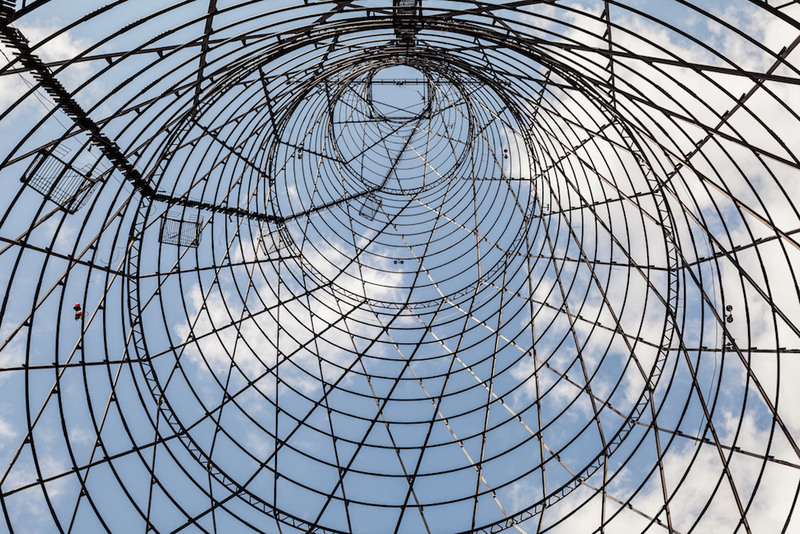 The legendary Shukhov Tower that looms over the south of Moscow is a rightly adored architectural construction by legendary architect and engineer Vladimir Shukov. Less known is that a similar radio tower exists in the small town of Dzerzhinsk, 24 miles south-west of Nizhny Novgorod by the Oka river. This beautiful metal monument has been watching over the surrounding area since 1929, when it was built along with five other similar towers as part of the electrification of the region. The towers were destroyed soon after when political priorities changed, but one of the set (a modernised version of the renowned Shukhov Tower in Moscow) still remains, in the middle of nowhere. Take a high-speed train from Nizhny Novgorod to Dzerzhinsk (the journey lasts about 30 minutes), then take bus 105 to Dachny village and walk for 10 minutes. Otherwise, try Bla-bla-car, which offers cheap shared taxi rides across Russia. Dreamy villages with stray horses are far from what you would expect in the Russian South, which is largely defined by Sochi sanatoriums and Caucasian mountain peaks. But this southwestern corner of Russia bordering Ukraine is defined by its rivers, bays, ancient Greek towns and Cossack khutors (farms). And Merzhanovo is no exception, marked by small huts with thatched rooftops, a lighthouse (part of a film set that was built for a local TV series), meadows filled with flowers, pink rocks and Taganrog Bay, part of the dying Azov sea, a vast expanse of crystal blue water that is only knee-deep. The fairytale of Merzhanovo could have been designed by Tolkien as a setting for his stories of Middle Earth. It is a short train ride from Rostov-on-Don to Merzhanovo. Best visited at sunset. This AJ Hackett Park is the perfect spot for adrenaline junkies: not only can you tread the longest pedestrian suspension bridge in the world, you can bungee jump from its head-spinning height of 207 metres. Compared to this, the world’s highest swing, which opened in Sochi in 2014, is mere child’s play. The hour-long journey into the mountains is straightforward. Regular bus transfers from Sochi, Adler, the Olympic Park and Krasnya Polyana are available every hour. Those who enjoy snaking car journeys with breathtaking views can use the local car sharing service Uren, which will prove much cheaper than a taxi. From the seventh to the 13th centuries, Volga Bulgaria (not to be confused with Bulgaria) was one of the greatest kingdoms of eastern Europe, a place where Islam flourished long before the arrival of the Mongols. 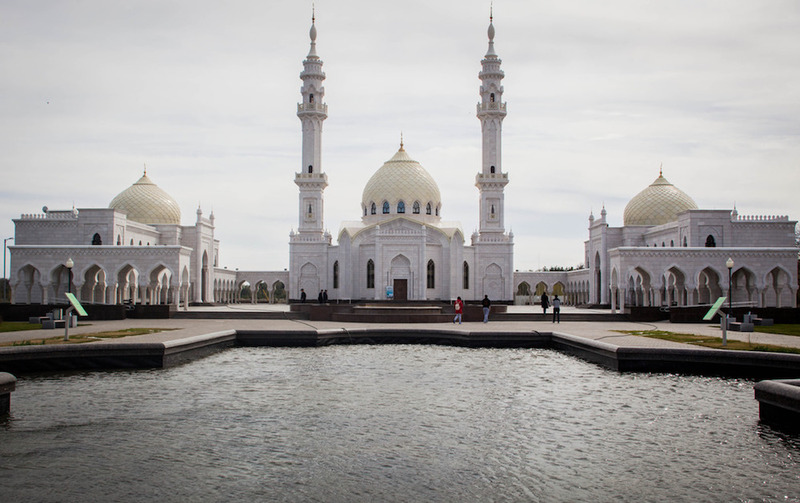 Its former grandeur can still be felt in the ruins of this medieval town and, surprisingly, in a giant, newly built white mosque, known coloquially as “Russia’s Taj-Mahal”. The small town of Bolgar, the “Mecca of the North”, may also be of interest to archaeology lovers. Bolgar is full of post-Soviet cafeterias with their own unique decor: photo print wallpaper, tinsel curtains (they’ll still be there in June, don’t worry), sticky table cloths with flower patterns and, of course, an owner who will serve you the best echpochmak (a traditional type of pie), lagman (meaty Tatar soup) or lamb kebab. Bus trips to Bolgar will take around two and a half hours, but the river cruise option is a lot more inviting. Apart from Bolgar and Samara, the ferry will take you straight back to the early 2000s in a heartwarming introduction to Russia’s decorative, festive and drinking traditions. Think endless forests morphing into clear blue skies, middle aged female singers fighting against birdsong for the audience on the upper deck, carefree promenades among the plastic flower and red carpets. Unlike the snowy peaks of Altai and the Caucasus, well known from travel accounts of Russia, the Ural Mountains remain underexplored. This is Europe’s natural border with Asia, a land of legends, gold rushes and mining. The forested peaks flow like a dark green wave. The Devil’s Fort is a group of granite rocks towering over the thick woods below. Located right between Yekaterinburg and Nizhny Tagil, the Devil’s Fort sanctuary is a gateway for those who enjoy long, thoughtful mountain walks, amateur alpinism and wild camping. The most exciting trail is the one that runs from Iset to the Severka railway station, passing through Devil’s Fort cairn, Peschanoe Lake and Falcon Rock (about 30 kilometres in total). Take any train in the direction of Nizhny Tagil, get off at Iset station and follow the route to Devil’s Fort. You’ll pass huge industrial plants before the embrace of the forest — a rich mix of factories and natural beauty, the sweet and sour Ural Mountains cocktail. St Petersburg is known as Russia’s Venice, a watery city haven with more than 30 islands intersected by canals and rivers. In the West, the Neva River flows into the Gulf of Finland and ferries link St Petersburg to Helsinki, Tartu and Stockholm. But only a few kilometres to the East the Neva flows out of Lake Ladoga, the largest freshwater lake in Europe. It was the crossroads of medieval trading routes from Scandinavia to the Black Sea and is dotted with beautiful small islands. 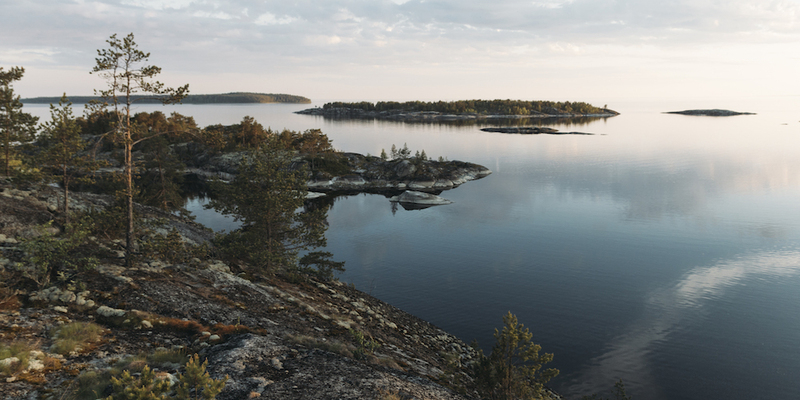 With dark green pine forests on its shores, Lake Ladoga is a hymn to Russia’s cold northern beauty at its best. One option is to take a ferry to the remote islands of Valaam or Kizhi. You can even read a book on the top deck in the middle of the night (the sun barely sets here in June). You can stay at newly built design hotels such as Tochka na karte in Priozersk or Sortavala to soak in the tranquility of this beautiful lake. The Ruskeala marble canyon is only 17 kilometres from Sortavala. The picturesque road from St Petersburg to Sortavala should take about five hours by car. Mordovia is one of those places people might think they’ve heard of (even if in most cases they’re thinking of Moldova) but know nothing about. This small region 400 kilometres southwest from Moscow has no natural resources, nor any great rivers, canyons or mountains. Apart from its network of former prison colonies, Mordovia is a meadow dotted with tiny lakes, ponds and villages with delightfully obscure names in local languages. If for some reason you’ve decided to spend an extra day in Mordovia (there is a local belief that everyone in the world has a relative in the region), or you are heading back to Moscow by car, stop at the Smidovich Nature Reserve — a peaceful retreat in pine woods. You can rent a wooden cabin by the lake and enjoy a warm summer evening in a place forgotten by history. The name Zhiguli may ring a bell — but these hills, just a few kilometres outside Samara, are nothing to do with the Soviet car or local export beer of the same name. They are, instead, the highlight of Samara Luka National Park, which occupies a giant natural island formed by a curve in the Volga River. 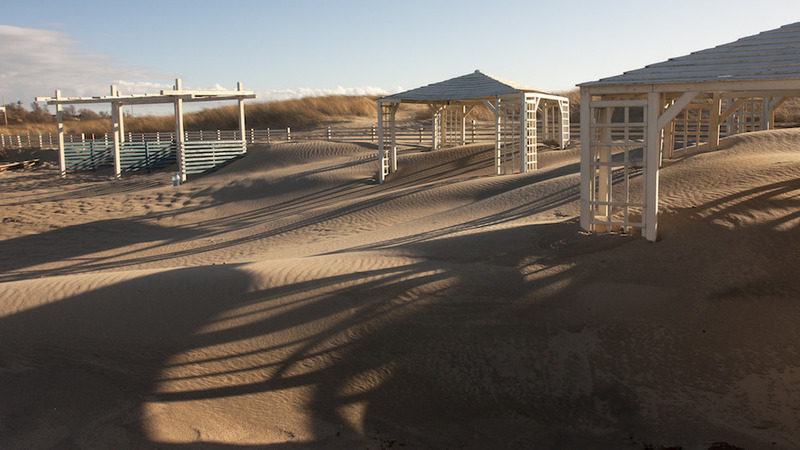 You can bask in the sun on a sandy beach, stroll through a forest or get a taste of provincial town life in Zhigulevsk. Design fans are advised to take a closer look at the local coat of arms: a magic bird soars over the hills with the Volga waves as her wings. The otherwise painfully romantic landscape is marked the industrial lines of a local hydroelectric station and the distant city of Togliatti. The journey from Samara is pretty straightforward: take a train to Togliatti or Zhigulevsk, then catch marshrutka number 168. If you only learn one word while in Kaliningrad, it should be yantar, or amber — which you can buy in every shop or stall in the city. The nearby town of Yantarny is where 95 per cent of world’s amber is extracted. This former fishing village was founded by Germans in 1654 and the neat, bright tile facades of typically Teutonic houses still dominate the town. 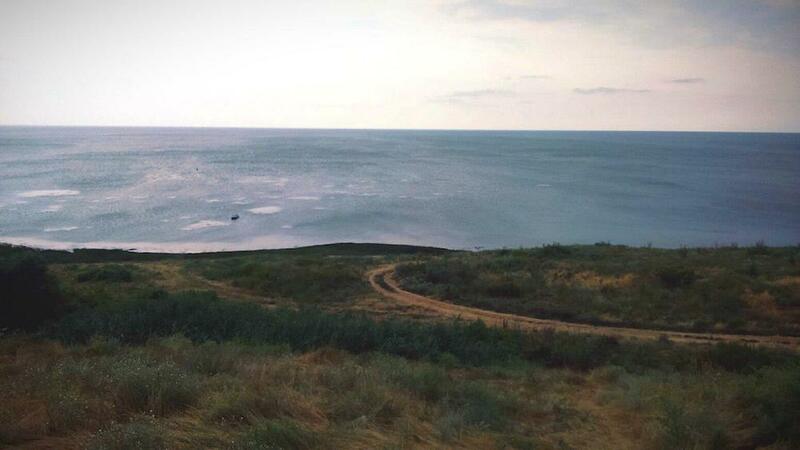 Compared to nearby Svetlogorsk, a popular touristy waterfont, Yantarny is more authentic and calm, offering the largest local beach and an otherworldly amber canyon by the sea. From Kaliningrad, you can get there by car or bus. You can also visit the amber plant itself at 1 Baelebin Street. 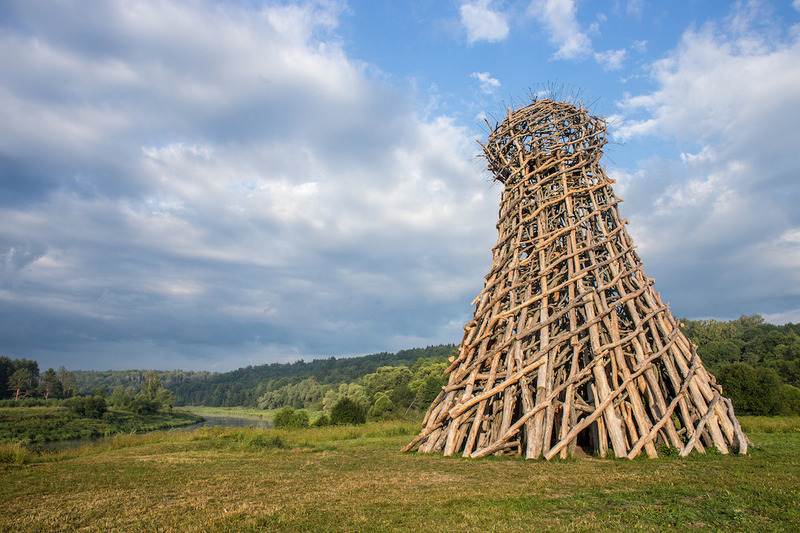 Nikola-Lenivets, known as the host of Europe’s biggest landscape design festival, Archstoyanie, is much more than an open-air art park. 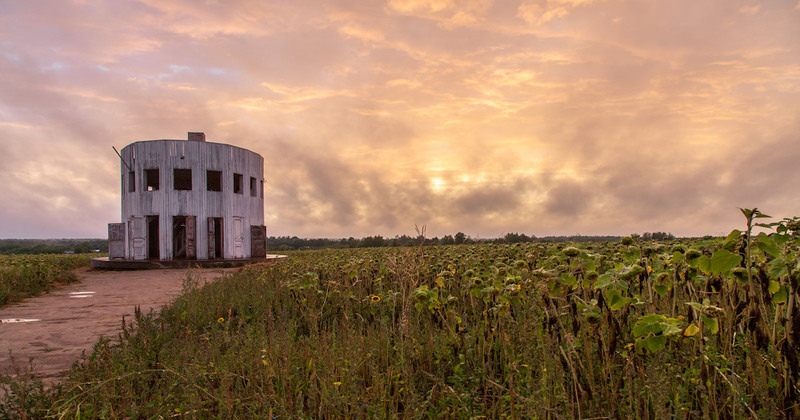 As you explore the area you will find over a dozen art installations among the woods and fields. Each of them explores nature, the universe, mankind and the relationships between them in a simple and poetic way. Most of the installations are easy to climb on or use as shelters but there are significant distances between them. As the wind blows, your thoughts come and go. 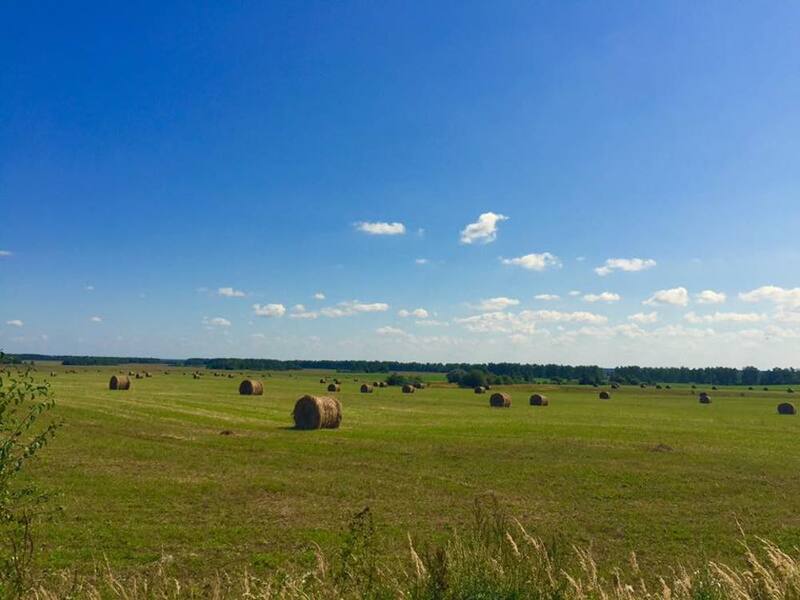 Thanks to Archstoyanie, the three villages that form part of Nikola-Lenivets were revived by locals who returned to farming and artisanal crafts. Book a small and cozy wooden house (they can accommodate up to six people), a hostel or just bring your own tent. The best way to reach Nikola-Lenivets is by car. Otherwise, take a bus from Moscow’s Teply Stan bus station to Kondrovo village and use a taxi for the last few kilometres.